I’m sure you’ve heard the adage, “Great minds think alike.” Well, it is definitely true and definitely not something a knitting designer wants to discover at the toe decreases of her finished design. I had this great spring green yarn (that apparently has been discontinued or I would’ve linked to it) and I was thinking it should have an organic pattern to correlate with its springy color, but a leaf pattern seemed too obvious. Lo-and-behold I came across this great undulating pattern that looks a lot like cabling without the hassle of cabling. After the appropriate testing I got started. Fast forward a bit and I was wondering why my spiral toe decrease didn’t seem like it was coming out quite right. 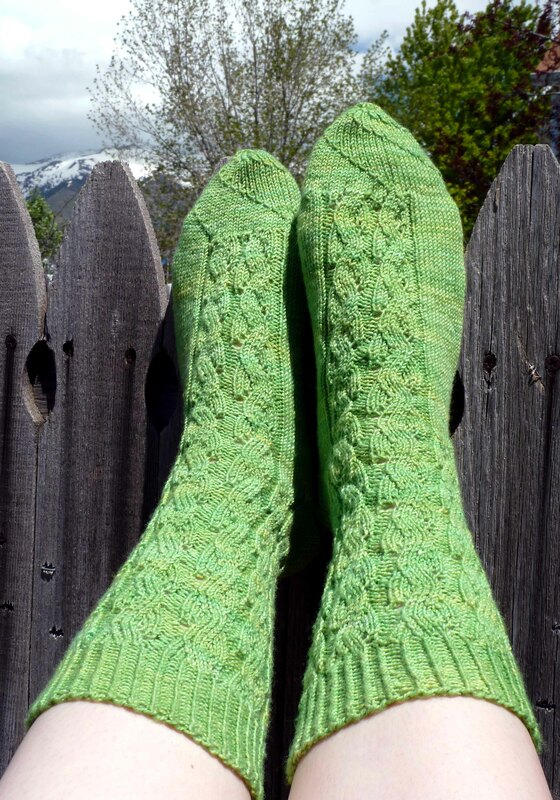 One google search later and by some knitting coincidence I happened upon feministy’s blog and her sock Maeby. Holy frijoles! That is the exact same stitch pattern I’m using! Oh, there are some differences in the socks — my cuff is longer, my heel is boomerang, my toe spiral, and I didn’t continue the pattern across the entire foot, but still the stitch pattern makes the sock, so we basically had the same sock. So, I thought, hmm, if she used this stitch pattern and I used this stitch pattern I bet we’re not the only ones. And no we are not. There is also Luminare by Bex Femme and River Rapids by Sockbug. And those are just the one’s I found in the comment section of Maeby on Ravelry. My finished socks! They make me happy!